You don’t have too look far in my mother’s homes to find little collections of things here and there. 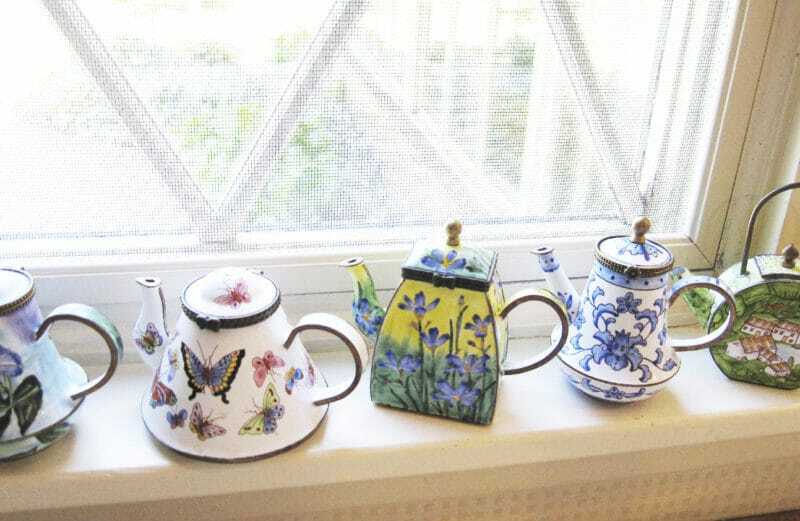 On Wagon Wheel Lane, she had a pretty line-up of miniature metal teapots on the window sill. On the piano, tiny Limoges and other sorts of porcelain boxes with hinged lids, some of them with a miniature surprise inside. There are other collections, but the mother of all of them is her collection of antique teacups, so many over the years that she has to select which ones she wants to display. She has always savored finding a treasure to match the others and adding each variation on the theme. The act of doing this always triggers memories of her mother; she especially loves to go out hunting with her sister, and the two of them set off on their walks down memory lane together. Which is why she was surprised when we were out antiquing one day last winter and I said I don’t collect, never have. Well you have to start a collection! she said with so much enthusiasm that I had to agree, and to wonder what I’ve been doing with myself all these years. Next thing you know, she’s laying her hands on the sweetest little pitchers everywhere she goes, and getting them for me. I’ve come into a lovely array that I keep near my desk. 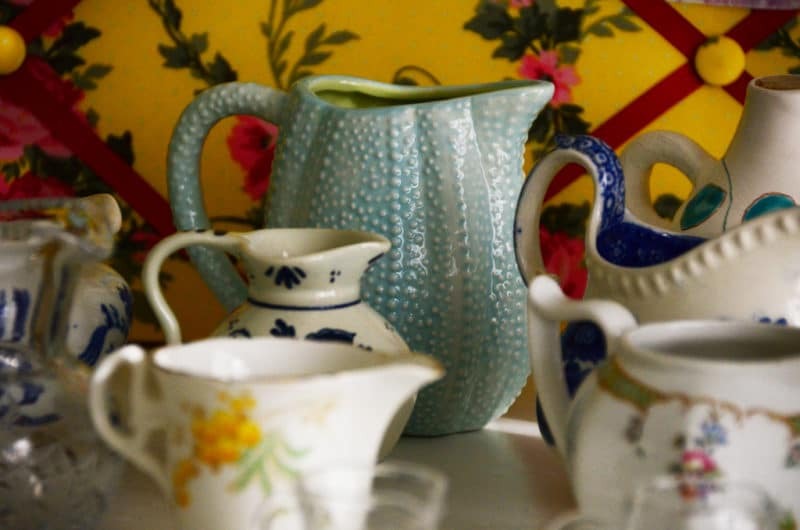 I’m coming to appreciate her way of collecting, and beyond that the pleasure of seeing patterns in the idea of the teacup or a pitcher, watching handles and spouts sculpted this way or that, each one different yet the same. 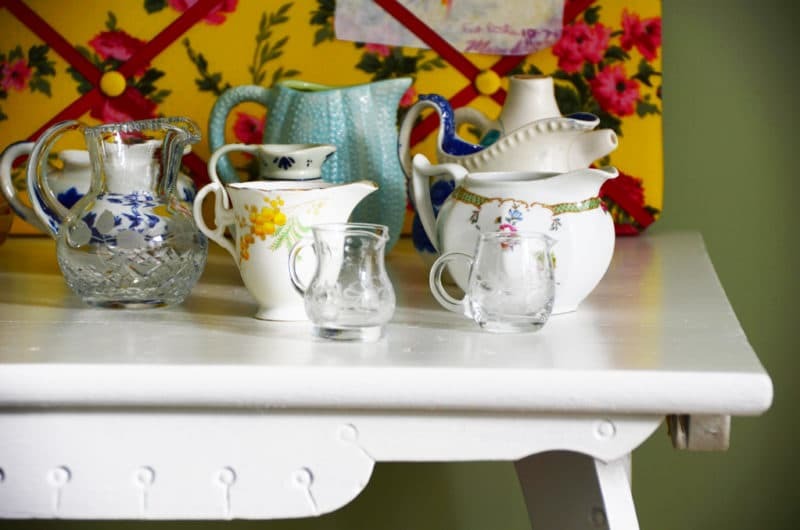 The little pitchers would have their raison d’être just sitting on the whitewashed table here looking pretty, but they do enjoy being put to good uses to hold melted butter or maple syrup, making a Sunday brunch that much more delicious. 3 Responses to "Favorite Things: little pitchers"
Uh oh…. once you start a collection, you simply can’t resist adding to it! And I speak from experience — my 16-year old daughter collects vintage china creamers and I collect vintage pitchers and tea cups, as well as many, many other things! Thrift shops have never been so much fun — I recently paid ONE dollar for a darling old Royal Doulton “Malvern” creamer in perfect condition! Who can feel guilty about that, I ask?!? You will have to keep your readers updated with all of your fun finds! pieces above, so lovingly photographed. I always loved how your Mom would have the tea cups on the piano when we were little. My tea cup collection is my favorite–I am glad she got you started on little pitchers.